I was raised on breakfast cereal, and there's none more delicious than granola. It's so filling (and usually packs a caloric punch), and that crunch just gets me. Even though it's not as hearty as full on granola, I think I could eat Honey Bunches of Oats every day for the rest of my life. 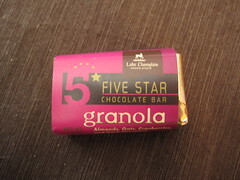 For this reason, the Lake Champlain Five Star Chocolate Bar in Granola called out to me. I bought it at the same time as their mammoth caramel bar. As you can see in the next picture, this one had a creamy chocolate filling with granola bits, nuts, and cranberries throughout. The bar smelled salty when I opened it. 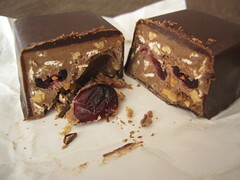 The chocolate filling was very creamy and smooth, making for less of a mouthful than the caramel bar. However, the bits and pieces in the middle made the bar incredibly salty. I liked the flavor of the almonds and cranberries, and the oats and granola bits added an subtle, slightly earthy vanilla flavor. The crunchy texture was fun, and the granola held up well in the filling. Unfortunately, it was just too salty for my tastes, so I had to detract some points from this otherwise delicious and unique chocolate bar.